Every cat should have a collar. Even if your cat is indoor-only, it's still a good idea to have a collar on them that will help them to get back to you should they get lost. 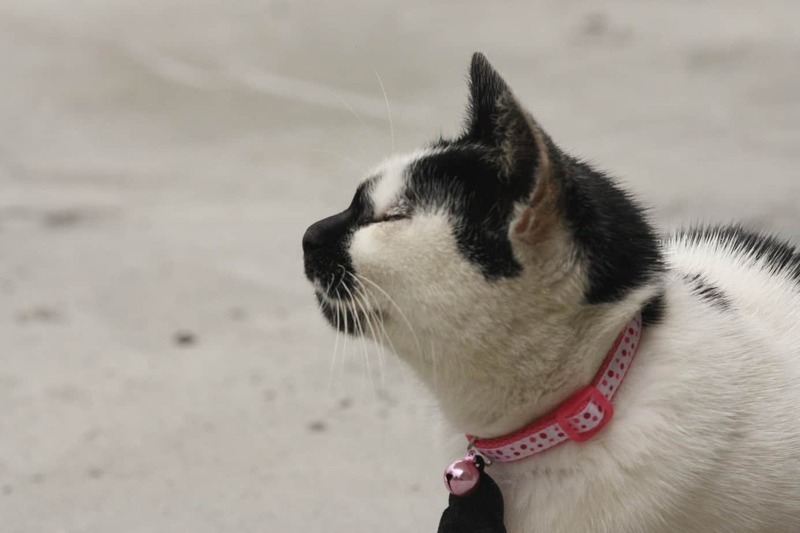 If your cat does go outside, a collar can help to mark them as a pet rather than a stray, and something reflective can help them to be seen when crossing the street. The collar also indicates that the animal is a house pet or tamed cat. The kind of collar you choose will largely depend on your pet's unique situation. In this list, we've included five highly popular cat collars that will work for a variety of different situations. Read on for help in choosing the perfect collar for your cat! Do I need a breakaway style collar? What if my cat isn't used to wearing a collar? How do I know if the collar is too tight? Do I really need a collar if my cat is micro-chipped? This simple, low-cost option helps your cat to be seen when they're out and about. It includes a reflective strip for high visibility and a cute cat-faced buckle for style. You can also opt for a pack of three or six depending on your needs. This is a simple collar. In a set of three you'll get one of each color: red, blue and orange. It's a solid piece, made from Nylon with a reflective strip and bell added. That way, you'll easily be able to see or hear your cat wherever they are. These are also breakaway collars, which means that if your cat gets their collar stuck on something then they will be able to pull hard enough to open the buckle and escape. This can help more adventurous cats from accidentally suffocating due. The breakaway style is highly useful and much safer than options that your cat isn't able to get out of. While this might cause you to worry about the possibility of your pet losing the collar too frequently, it's a worthwhile balance because it allows your cat to escape potentially deadly situations. It's also a very budget-friendly option, which means replacements aren't going to cost you a ton if you need them. They also come in a more bulk style so you can have extras on hand if your cat loses the collar they were wearing. It can be a little uncertain as to whether or not these are actually breakaway style or not, but that's largely due to earlier options not being breakaway. It's still a good idea to check the collars as soon as you get them to make sure they are the correct style. Some customers also find that the reflective strip is fragile and can easily be peeled off. Because of this, it's important to check the collar regularly to make sure it's in good shape so that your cat can be seen when they're out. This inexpensive option has a beautiful color and a great design. It's made with a buckle design rather than breakaway and is designed to be small and lightweight for pets that aren't fans of thicker, larger collars. This is a nylon collar that comes in a fantastic mint blue coloring great for any gender of cat. It's a great option for those with mellow indoor cats who don't need a reflective addition. It also includes a small bell so that you can hear where your cat is whenever they move. You can get this in a single pack, two pack or three pack if you have multiple cats or just want to have one or two extra on hand. It's also easily adjustable for a wide range of breeds and sizes of cat. This collar has a great look. The color is gorgeous and it's very lightweight. The buckle design looks great, though it may not be the most ideal for safety. For some fluffier cats it can sometimes work better than thicker styles. It's also designed to be a durable option so that you won't have to worry about purchasing a replacement for a long time. Because this isn't a breakaway collar, it does have the possibility of causing a problem if your cat gets it stuck on something. The cat won't be able to escape, which can result in a very unpleasant situation. That said, if your cat is not as adventurous or an indoor cat with a lot of supervision then it can be an okay option. Another problem both cats and owners find is the bell. The sound the bell makes can be annoying to others and it isn't going to be easy to remove. While these collars are a little more expensive than other options, they also allow for the ability to personalize information sewn onto them that can help to get your cat returned to you if they get lost. You can include things like your pets name and your phone number for easy information. With these collars, you'll get your choice of collar color, embroidery color and the characters added to the collar. Typically, these will consist of your cat's name and your phone number. That way, if your cat gets lost someone who finds them will easily be able to contact you and let you know they found your beloved pet. These are also breakaway style collars, which means that if the collar gets stuck on something, your cat will be able to get free. This is a simple, easy way to make sure people can contact you if your pet manages to get lost. They definitely won't miss the large, embroidered letters sewn onto the collar. The customization also allows you to choose the colors that you prefer. 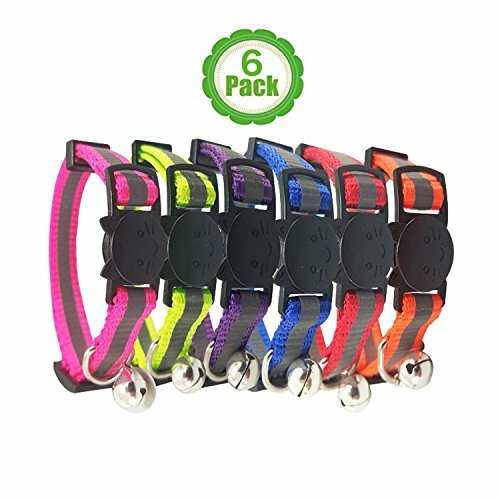 These are made to be long-lasting collars, and they also include a breakaway buckle just in case your cat gets stuck somewhere. If you're looking for something that is highly aesthetically pleasing, these may not be the ideal option. These collars are largely designed for function rather than looks. Some customers have also had problems with adjusting the collar for smaller cats as the embroidered portion tends to get in the way. In some rarer instances, the collar can start to fall apart easily. Because of this, it's important to check it regularly to make sure that the collar is in good shape. This unique collar comes with the ability to glow in the dark. It is a little more expensive than other options, but includes and adorable design and great breakaway style. They also come in a variety of colors and designs so that you can choose the perfect aesthetic for your cat. The adjustable design on this collar makes it great for a variety of cats. It's also made to be highly durable so you won't have to worry about replacing your cat's collar too often. The removable bell also allows you to either hear your cat when they move around or not. The breakaway feature also functions to keep your cat safe and the glow-in-the-dark design allows you to keep track of your cat even in the dark. The design on these collars is absolutely adorable. There are options with little cats and fish on them or some that include paw prints as well. 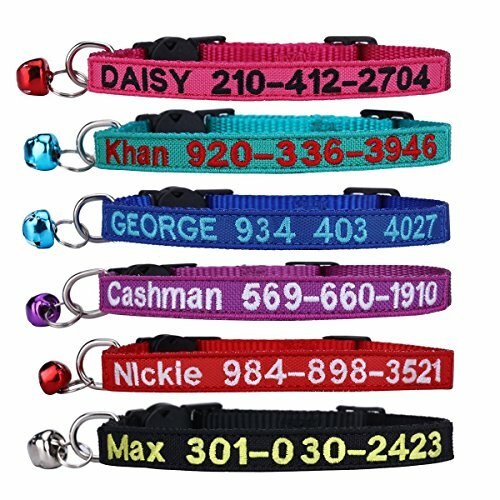 They also come in seven different colors so that you can get the one that looks best on your beloved pet. Not everyone likes the sound of the bell on a collar, so the makers of this collar have made the bell easily removable for those who prefer no to hear the sound every time their cat moves. With the breakaway feature, not only is this collar adorable but it's also safe! While it looks cute, this may not be the most comfortable collar. It can be a little stiff and rough according to some customers. Others find that the glowing feature also only lasts a few minutes in the dark, which can be unfortunate if you really want to be able to see your cat at night. In some circumstances, customers have trouble with getting the clasp to stay closed which can lead to the collar coming off too easily and getting lost. For those who want something that looks fancy at a lower cost, these collars are a fantastic way to go. They include a gorgeous heart pendant in the middle and are made with a soft velvet covering to stay comfortable. These collars are designed to be comfortable and beautiful. They include some added stretchy material to help it to fit properly and avoid choking your cat. They do have a buckle style rather than breakaway but that stretching factor can help in many cases to add some safety and even potentially allow your cat to escape if it gets stuck. There are a variety of available colors including blue, red, black and pink so you can get the ideal color for your pet. These are a great way to keep your cat looking dapper without a high cost. You'll find that there is a fantastic combination of comfort and aesthetics in the design of this collar. The covering is soft so that your cat won't have to feel a stiff, uncomfortable material against their neck. The heart pendant also makes for a fancy overall look. Many customers find that the bell is a nice addition, but not often loud enough to irritate them. The buckle is also made to be durable so that it won't wind up breaking after only a few months of ownership. While the stretch-factor on this collar can be helpful, it doesn't fully replace the safety that a breakaway can provide. The design is also highly feminine, which may not be as suitable for those who have male cats or simply want a quieter design. Unlike other options, the bell isn't easily removable. This can be a problem for those who don't like the sound. It is adjustable, but may not fit cats of all sizes. On top of the overall look, there are a couple of things that are wise to keep in mind when you're shopping for a new collar. These include the durability and comfort, which ensure it lasts and is something your cat doesn't mind wearing and the safety aspects at home. No one wants to have to buy new collars every few months, so it's important to get something that is going to be durable. One aspect of this to keep in mind is how often your cat needs to scratch itches in their neck area. The scraping of claws against the collar can cause nylon collars to fray more quickly. Getting a more durable collar and ensuring your cat is well-treated for fleas and other parasites can go a long way. You'll also want to get something that won't be uncomfortable on your cat. That means it needs to be well fitted but not too tight against their neck. The material should also be soft enough to not be irritating to them. It's a good idea to get something that can stretch or adjust if your cat is younger and still growing. This is the most important aspect to consider while shopping for a collar. There are a lot of collars made with buckle designs and while these might sometimes look better, they can be dangerous for cats. Cats like to adventure, and in the process their collar can sometimes get caught on things like branches, knobs, fences, and other things. If your cat isn't able to escape, this can be a deadly problem. It's much less inconvenient for you to have to buy a new collar rather than lose your beloved pet. Because of that, breakaway collars are highly recommended. In some cases, a non-breakaway option can be okay if your cat is often supervised. This is something you will have to consider for your unique situation as you look for the ideal collar. On the most basic level, if your cat will be going outside or spending a lot of time at home without supervision, then a breakaway collar is highly recommended. Otherwise, just make sure to keep an eye on your cat in case the collar gets stuck on anything so that you can help them out of the situation. In most cases, it's better to get a breakaway collar than to risk a situation where your cat could be choked. The easiest way to know is to measure around your cat's neck. You can do this easily by taking a piece of string and carefully placing it around the neck. Make sure when you do this that the string isn't too tight, just resting against the skin. Then, mark or cut the string until it is the perfect length to fit comfortably and measure it against a measuring tape or ruler. This will give you an idea of what size the collar needs to be. If you have a kitten who is still growing, it may be a good idea to get something that can easily adjust to larger sizes. You might also want to check out cat sizes guidelines just to be sure. It can take some cats a little time to get used to the feeling of wearing a collar. This is especially true if the collar has a bell on it. If this is your pet's first time wearing one, make sure to keep them inside while they get used to it. In most cases, the cat will seem distracted by the collar for a few minutes, but within a couple of hours will get used to it and calm down. If you want to help speed the process along you can offer them treats or try to take their mind off it by playing with them. It's important to make a habit of checking the collar regularly to make sure it's fitting well. You should be able to fit your finger into the collar without it becoming too tight on your cat's neck. If you aren't sure then it is always better for the collar to be a little too loose rather than too tight. Over time, you'll be able to make small adjustments to ensure it has the ideal fit. The short answer to this is yes. If you have an indoor cat and they get outside, people aren't going to know that your cat is micro-chipped just by looking at them. In these cases, they will be likely to think your cat is just a stray and leave them alone. However, a collar marks your cat as owned. This can help people to see that it isn't just a stray running around and can make it easier for your cat to be returned. People who find cats with a collar will be more likely to use the information on it or take them to get checked for a microchip. Overall, a collar is a great thing to have for your cat whether they are indoor, outdoor or both. They are a great way to help lost cats get found and just let people outside know that your cat is a pet rather than a stray. Depending on your cat and budget, the options in this list are great for a number of different situations and needs, including those who simply want their cat to be seen while they're out at night. Many are also lower-cost, helping you to find the perfect solution without breaking the bank.